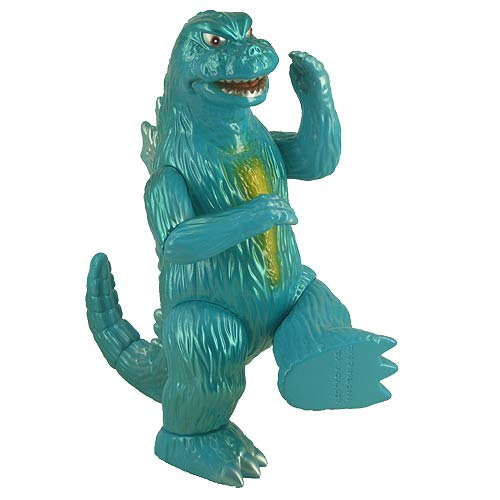 Originally released in Japan by M1 in 2004, this Godzilla Vinyl Wars 1965 Daisenso-Goji Version Sofubi Vinyl Figure captures Daisenso-Goji, the Dancing King of the Monsters, as he first appeared in the 1965 Showa-era classic Invasion of Astro-Monster (a.k.a. Monster Zero)! With his multiple points of articulation, bluish-green deco, and is a limited edition of only 200 pieces. Godzilla fans can stage their own meme-worthy moments on their shelves! Ages 15 and up.